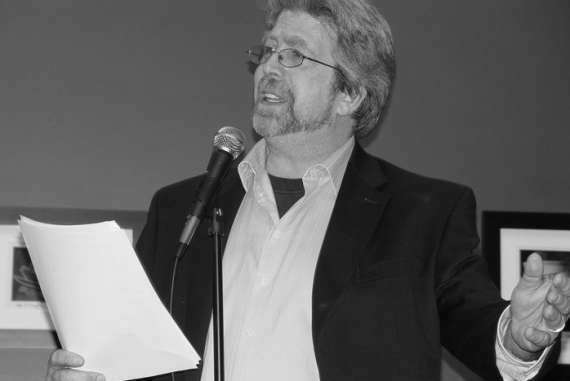 Currently the Poet Laureate of Dedham, MA, Christopher Reilley is a long time prepress tech, print geek and former self publisher, now a father and poet. He describes himself as a conglomeration of everything he has ever done, seen, felt, caused, experienced, observed and survived. He has held many jobs in his life, from working in restaurants for over twenty years - both in front and in back of the house - to being a freelance illustrator and designer, a print expert, a computer help technician, a door to door salesman, an on-air television face, producer, sign maker, delivery truck driver, stand up comic, and donut maker, but his favorite job is being a father to his two lovely daughters and his son. He is fiscally conservative and socially liberal, a collector of both masks and comic books, and has recently returned to painting as a serious endeavor. He does all the cooking in his house, has acted in community and regional theater, and knows all the words to "If I Only Had a Brain". And yes, it is true, he did graduate from clown college in 1987. Once upon a time, Christopher developed the Book in Time print-on-demand work flow for Xerox, which eventually became the default system for Bertelsmann, the largest book printer in the world. He is currently preparing a full length manuscript of love and passion poems for publication next spring, entitled "Slippery Friction". Christopher Reilley can be found on his own Facebook page Poetry of Reilly, or fronting the Facebook page of the Dedham Poet Society. from the broken glass doors. one with whom I will never speak. his head pressed against the windows. now locked away for the night. a knight crafted from office materials. my own eyes peer out from his tangle of curls. and I am more comfortable that way. from the keening of last winter’s gales. whether they will caress or sting. may sail forward into Fall. in hopes of spawning anew.